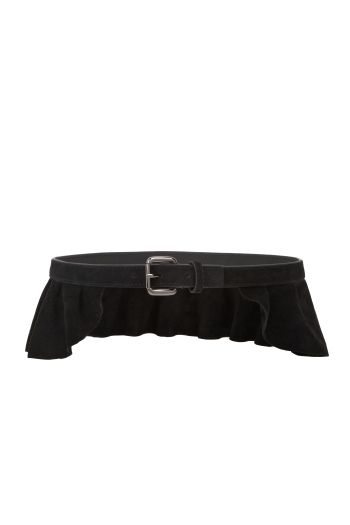 Peplums have been all the rage recently, and I just discovered this belt from BCBGMAXAZRIA. Actually I'm not very sure how the brand name goes- based on the company website it's actually 3 words, but on the tag and my receipt it's just one word. I picked this up and I've been loving the look! The leather feels a bit like suede, but it is not as furry or soft as the usual suede. Based on the materials, and according to the SA, most part of the belt is actually made of leather, but the flappy peplum is faux leather. The belt is found here. It was not on sale, but I was able to enjoy 10% off due to a promotion in the store. They were pretty much out of sizes, so I got it one size bigger than my usual and I'm planning to punch holes in it. The belt can add a nice chic touch to outfits that don't already have a peplum, and it's a good touch to dresses and pencil skirts. I love how lush the leathery peplum feels. It's definitely more structured than those that are made of cloth. I've seen a cloth (viscose, I suppose) version at H&M earlier. It was really pretty, but less structured. I'm intending to DIY my own peplum soon, and really excited about it! Shall probably use this one as a rough gauge, though I'll experiment with more colors and sizes. This peplum is pretty short, so it's more suitable to be worn high up on the waist. Looking forward to style more outfits with the belt!